* Levels 3 and below are not available in manual settings. Available in the Smart Rendering settings only when such levels are used in the source materials. Available values depend on the source files' characteristics. ** When using the Intel Media SDK Hardware encoder, the maximum resolution is 1920×1152. *** 2 pass not available when using the hardware encoder. **** When using the CUDA encoder in MainProfile, the maximum Level value is limited to 5/6; in HighProfile, the maximum Level is limited to 4/6. (Ex. : In Level 4.1 the maximum is 50 Mbps, in Level 5.1 the maximum is 240 Mbps.). ***** When using the hardware encoder, only the "Normal" level is available. * Only the Stereo channel mode is available in MPEG-4 HE-AAC v2. Audio down-mixing occurs when the Clip's audio data is multichannel audio and is higher than the number of channels set in the Audio settings. ** Available bitrate values depend on the sampling rate and the channel mode. ** 2 pass not available when using the hardware encoder. PGMX menu editor Possibility to edit the PGMX menu screens. Highlight settings, motion menus and supports many menu video edits. Possibility to add templates to the current templates. Source range Specifies the part of the clip that will be outputted. Fast thumbnails Fast navigation within a clip during cut-editing and chaptering work. Undo/Redofunction Registers cut-edit, source range and chapter changes. Playback audio volume Changes the audio volume during playback in the cut-edit/track preview, etc. Cut-edit Arbitrarily removes one or more parts of the clip. Outputs only what remains. Chapter setting Inserts chapter points at arbitrary positions. Chapters can be changed into split points. Advanced adding chapters Automatically set several chapter entry or split points according to a specified interval, number or time. Clip splitter Allows you to arbitrarily split a clip into two or more independent clips. Fast display mode Accelerates the video preview rendering. Smart scene search Clicking on the middle mouse button activates the Smart scene search, moving the playhead to the closest scene change. Scene change detection Detects any scene change within the re-encoded parts of the clip to output an I Frame. Aspect ratio conversion Allows you to change the aspect ratio of the output. Noise reduction Reduces the random noise from a recording. Gap correction Allows you to correct video/audio synchronization by the millisecond. Time tone reduction Reduces the short range frequency time announce tone added to the audio of a TV program. Volume change Changes the volume from 0 to 500% of the source volume. Normalization Changes the volume so the highest audio level is equal or lower than 100% of the output. Uniformization Uniformizes the volume based on the peak or average audio level. Fade-in/out Applies an audio fading effect at the beginning and/or the end of the clip. Multistream capabilities Allows you to set up to four independent audio streams in the PGMX file. Bilingual capabilities Allows you to output the left (main language) or right (secondary language) part of an audio stream, or output both. Audio conversion High quality converters adapt the audio format from the source to the PGMX format. Sampling rate conversion High precision 32 bit floating point audio processors can convert from and to any required sampling rate. Proxy file support Helps to accelerate the cut-editing of high definition files by creating an intermediate, smaller version of the source. Offers five levels of picture quality and size (this has no effect on the output result). 1-pass and 2-pass full encode Entirely converts non-compliant video/audio files to PGMX format. 2-pass full encode requires more processing time but allows you to get a picture quality and output size closer to the specified values. * 2 pass not available when using the hardware encoder. Smart rendering support Outputs the PGMX file format by using the Smart Rendering Engine (no quality loss besides cut/join points) for supported MPEG-4 AVC/H.264 file. Transition effects Creates a transition effect between clips. Slideshow edit Creates a slideshow with transition effects and music from still pictures. Can sort the source pictures based on the file name or date taken, and add a transition effect between pictures. Color matte clip Creates a clip from a color, a gradation or a tiled picture. Subtitle insertion support Adds up to 8 subtitle streams selectable in a PGMX compatible player. * Text and picture formats are supported. Clipboard support Take a capture of the video in the preview window and place it in the operating system clipboard for use in another application (BMP format). Chapter data importation Can save and load the chapter data. * Supports keyframe files (.keyframe) outputted by TMPGEnc series software. PGMX/TS importation and analysis When a PGMX/MPEG-2 TS contains several streams, its content is analyzed, and video, audio, and subtitles (ISDB, DVB, ATSC, Close Caption, plain text) data can be selected for importation. * Unsupported video and audio CoDec formats are not imported. DV/HDV device capture support *14 Transfer and use the digital video data from a DV/HDV camcorder through an IEEE1394 (i.LINK) connection. DVD/Blu-ray/AVCHD importation *4 Imports the video and chapter information from a non-protected DVD-Video or DVD-VR, Blu-ray/AVCHD. Media Center importation support *9 Imports Microsoft TV recording files (.dvr-ms, .wtv) generated by Media Center. Batch Tool Registers several output projects and automatically outputs them one after another. Pegasys project file importation *15 Can add a TMPGEnc Video Mastering Works 5 (sold separately) project file as a clip. 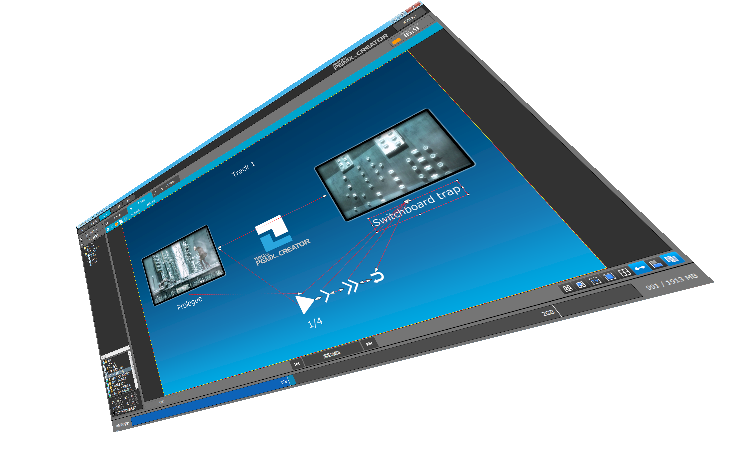 Uses the Intel Media SDK Decodes and encodes MPEG-4 AVC by using the Intel Media SDK. * Requires an environment with an Intel compatible CPU's (SandyBridge core and newer) and compatible driver with Intel Quick Sync Video functions. * Decoding and encoding processes through the Intel Media SDK require setting both the MPEG decoder selector and encoder. If the CPU can be used for hardware processing, the Intel Media SDK Hardware option is usable. Uses NVIDIA CUDA 3.1 Can use NVIDIA CUDA to perform filtering calculations, MPEG-1/2 and MPEG-4 AVC decoding and MPEG-4 AVC encoding. * Requires the installation of an NVIDIA CUDA compatible device and the NVIDIA 3.1 driver. Jog shuttle support Key shortcut definitions in the clip cut-editor includes those used by a jog shuttle. CPU priority 5 CPU usage priority allocation levels from idle time only to full time process. Final task Shuts down, goes into stand-by or hibernate mode when the output process is completed (available options depend on the machine and operating system). News Center online notification Receives update information, etc. directly from Pegasys/TMPG Inc.
*1 MPEG-1 VBR (variable bitrate) file import is not supported. *2 Depending on the settings and device used, an audio gap may appear in the captured movie data. Use the trial version to verify the quality of your capture system. *3 Transport stream importation tested with sources generated by a JVC GR-HD1 and a SONY HDR-FX1/HC1. *4 DVD-VR importation requires a media compatible drive and UDF 2.0 support. Standard Windows installations are not able to copy or read the UDF 2.0 format; such functions cannot be used. This application cannot process DVD-Video protected by a Copyright or anti-copy enforcement system such as CSS and CPRM. Importing Blu-ray (BDAV/BDMV) format data requires a drive compatible with the media type and a UDF 2.5/2.6 reader. Copyright-protected Blu-ray (BDAV/BDMV) cannot be processed. *5 Microsoft TV PVR file (*.dvr-ms) importation requires the computer that recorded the video, or a computer that supports Media Center PC video recording file playback. WTV file importation is possible on the computer used to record the file, or on a computer able to create this type of file. Recordings copy-protected by a DRM scheme cannot be imported. Only WTV files containing MPEG-2, H.264/AVC video and MP2, AC3 or AAC audio can be imported. *6 Some DV/HDV camcorder and IEEE1394 (i.LINK) connection compatibility issues may prevent a correct capture. *7 The video YUV colorspace is interpolated to 4:4:4 with the Type-2 DV codec used by our company for AVI input, allowing higher picture quality. Except for uncompressed AVI, AVI file input requires the codec corresponding to the format. Type-1 DV and other importations through DirectShow depend on the available environment. For this reason, it is normal for some AVI files to not be readable. Audio may not be available in the second clip when no more than one instance of a codec can exist at a given time within the system. *8 QuickTime file importation requires QuickTime 7.7.4 or newer versions (audio may not be correctly processed in case of a multitrack audio source file). *9 Windows Media file importation requires that Windows Media Technology is installed on the host computer. Data broadcast live on the Internet is not supported. Files protected by the Windows Media Digital Copyright Management (DRM) are not supported. Files without a Seekable (cue) flag are not supported. *10 PV3 video recording file importation requires the Hearth Soft "AviUtl plug-in EARTH SOFT DV.aui Ver 2.4.4 or Ver. 3.0.1" correctly installed. Versions other than 2.4.4 or 3.0.1 do not function. Recording data recorded with the AviUtl plug-in EARTH SOFT DV.aui Ver 2.4.4 require Ver. 2.4.4 to be imported, data recorded with the version 3.0.1 require Ver. 3.0.1 to be imported. Processing the audio of a PV3/4 video recording requires that the audio format is LPCM. *11 Importations through DirectShow or MediaFoundation require the format CODEC (playback software). Available CODECs may differ depending on the computer. For this reason, it is normal that some AVI files are not readable. Some specific formats used (VBR, ogg, etc.) may result in an audio gap or may not be outputted. *12 Dolby Digital/Dolby Digital Plus audio importation supports data up to 5.1 channels. *14 There is no analog capture or capture through USB functions. *15 Supports project files created by TMPGEnc Video Mastering Works 5 Ver.5.2.3.66 or newer. A file created using a previous version cannot be added to the clip list. TMPGEnc Video Mastering Works 5 must be installed in the same environment as TMPGEnc Authoring Works 5. Some VOB/VRO files, MTS files recorded in DVD-Video/VR format may not be correctly processed. (always use the "From a DVD/BD/AVCHD..." option in the Source Wizard). Supports video files generated by the TMPGEnc series software encoder, most video capture devices and DVD recorders. Depending on the settings and device used, an audio gap may appear in the captured movie data. Use the trial version to verify the quality of your capture system before purchasing the retail version. Partially damaged source files may not be imported at all. This application cannot process data protected by a Copyright or anti-copy enforcement system such as CSS and CPRM. When creating a PGMX file larger than Full HD, insufficient memory or other errors may occur during the output depending on the source files/menu structure etc. Upon creating a PGMX file larger than Full HD (ex. : 4K size), playback may not function properly depending on the playback environment. In such a case, reduce the output size. Pegasys Inc. and TMPG, Inc. are not liable for any damage arising from the utilization of this product. * Product characteristics may change without prior notice.